The ancient Greeks recounted many legends about the earliest rulers of the Earth, a number of gigantic proto-gods called “Titans”. 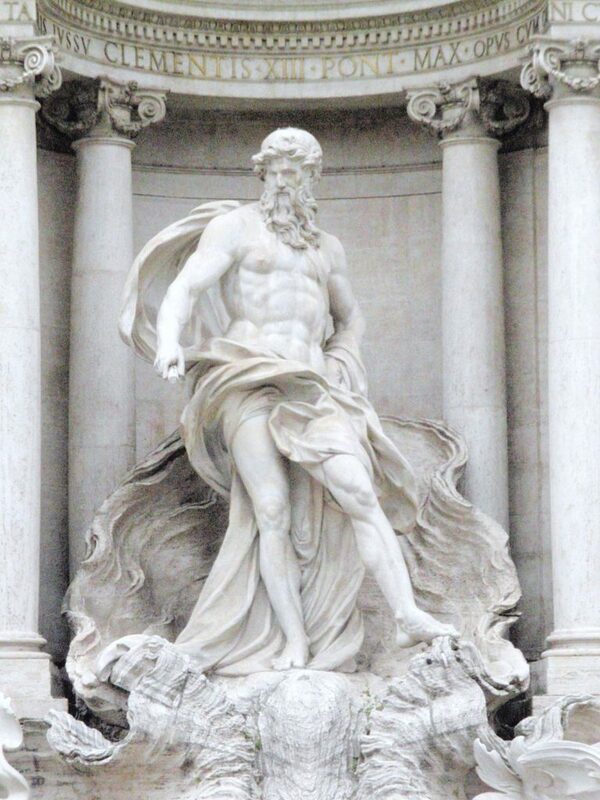 The ancient Greeks believed Oceanus, one of the Titans, exercised control over the world’s first oceans and waterways. Many early works of art depict him as somewhat resembling a man. He usually possessed the tail of a fish and a set of horns on his head resembling crab claws. Some artists depict him with the horns of a bull instead. In most works of art, Oceanus appears carrying a snake in one hand and a fish in the other. He sometimes holds an oar. Different versions occur in legends about the origins of Oceanus. Some stories describe him as the child of two mighty natural forces: Chaos (the beginning of everything) and Gaia (the earth). Other legends call him the eldest son of the earliest two Titans, Uranus (the ruler of the sky) and Gaia (the ruler of the Earth). It seems clear Oceanus ranks as one of the most ancient Greek gods. According to legends, several of the Titans eventually rebelled against their father. However, Oceanus did not take part in this uprising. He oversaw the waters on the edge of the world, and also ruled over the waterways separating Earth from Hades, the shadowy realm of the dead. Oceanus married his sister, a Titan called Tethys. She carries a close association with water, also. Pictures of her in ancient Greek and Roman art usually show her with long dark hair parted in the middle, and a set of wings on her head. Many scholars believe the wings signified her role in summoning rain clouds. She played a part in dispersing water through the earth, helping it to fill underground rivers and springs. While his brothers battled with their father, Oceanus and his wife Tethys spent their time raising a very large family. They had many, many children. Some sources claim the ancient Greeks described their sons as Potamoi (the earliest gods of rivers and streams) and their daughters as Oceanids (nymphs). Their daughters included nymphs associated with natural features, such as woods, ponds, beaches, trees, brooks, flowers, and meadows. Oceanus and Tethys produced well over 3,000 children! One of the couple’s daughters became the mother of ocean nymphs called “Nereids”. Another daughter, Pleione, became the mother of nymphs who eventually transformed into the seven Pleiades stars. Many stories in Greek mythology describe the activities of these minor deities. The ancient Greeks believed a conflict eventually arose between Zeus, a nephew of Oceanus, and the Titans. Zeus eventually won this struggle. He banished the Titans who had opposed him. He ruled from Mount Olympus with many of his children. During this epic battle, according to most legends, Oceanus did not enter into the conflict. In fact, some of his children eventually joined the gods and goddesses living on Mount Olympus. Yet Oceanus himself never moved there. Instead, the ancient Greeks believed he remained ruling a large waterway which encircled the known Earth.